VORONEZH, September 1 - RIA Novosti. Promising high-speed helicopter (PSV) is developing in the interests of the Defense Ministry, is expected to be released in the series with 2022 and can reach speeds of up to 500 kilometers per hour, said the Chief of the Air and Space Forces (VKS) Russia Viktor Bondarev. "This work is well underway, and in 2018 due to fly the helicopter demonstrator. Then the end of the (work) - 2021 and 2022 - a series of these helicopters. The speed - up to 500 kilometers per hour," - said Bondarev. He noted that this rate is set in the tactical and technical requirements on the advanced helicopter. "If you get more, we will be happy. Of course, this helicopter will solve all the problems that are now solved helicopters of Kamov and Mil. He will take all the best," - said the commander in chief. While work on the new helicopter is conducted jointly by Mil and Kamov within the holding company "Russian Helicopters". "And that, and that the firm is involved. Whose win that and will continue to carry out all work on the helicopter", - summed up Bondarev. 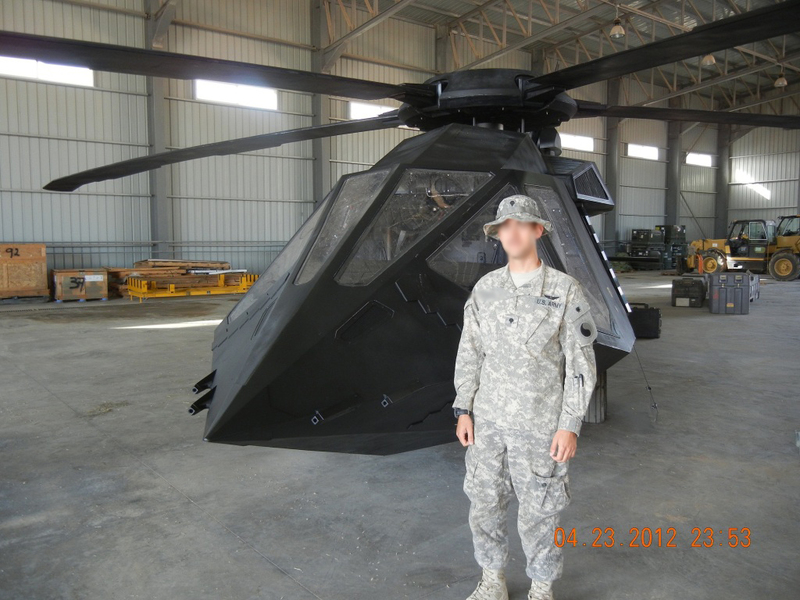 A project developing a stealth helicopter. Im wondering if anyone has heard anything since? Rumors over rumors over rumors, nothing specific. Werewolf wrote: Rumors over rumors over rumors, nothing specific. It would have to have a very high ceiling (relatively speaking) to justify the stealth shaping. Stealth in helicopters for the concept as we know is as overrated as a UAV drone in video games. Helicopters like this concept shows with internal weapons bay, suggests it is used for Attack purposes, meaning its main targets will be ground targets. Regardless how stealthy you achieve to have a helicopter it is still 100 times higher RCS than any F-22 and they already can be detected by ground based Radars. The concept of stealth is to reduce enemies detection range and therefore extent your own long range capability without entering effective, lethal or detection zone of your enemy, staying out of its envelope key to fullfil objectives. The problem here is that is a helicopter, it has rotating rotors... what a twist...any old Pulse doppler radar can and will detect the turning rotors, meaning high altitude flying to get to its objectives will be useless, it will be detected before it can reach its own engagement range to its target, while ground based SAM/SHORAD/AAA have enough range to detect and destroy it. The current best technology in stealth is NoE flights, they render most radars useless and even radars like russians use for incoming cruise missiles at very flat trajectories will have detection range when the helicopters have reached their engagement range, of course in case of russian SAM batteries, there will be enough Panzirs, Osa's, Tor's, S-300, Shilkas or Tunguskas that it won't matter much, bust still the currently only possible and most effective way to reach enemy ground forces protected by any kind of SAM/SHORAD/AAA will be NoE flight otherwise they are inferior in detection, weapons range, effeciency and purpose of such a job. SEAD isn't particullary best for helicopters even tho they come closer and closer to such with KH-25ML/MPU and KH-31 ASM's. Of all the threats to a helicopter on a modern battlefield, radar is not a very high priority. Most helicopter losses in recent combat are from small arms fire and manpads... and of course pilot error in bad weather conditions. In a WWIII type scenario a modern fighter would easily deal with enemy helos, and in that situation a stealth capability would be useful, but for their primary air to ground role stealth would just be a waste of money... and make the aircraft more expensive to buy and to use, for no practical performance advantage. I suppose this is the reason why RAH-66 never made it to production. BUT.... making helo heat signature significantly smaller and its distinctive sound as well - one can easily find significant advantages to that. Sometimes it is best to maintain altitude high above the mountains to conserve fuel. Actually GarryB, jets have a hard time fighting against helicopters. The common altitude for Attack helicopters is quite low, the time and range of jets to detect and achieve a lockon to them at such altitudes is relative short, when equipped with dedicated ATAM's, Attack Helicopters have actually an advantage over any fast mover, they do not need to maneuver around to get a lockon like jets do, with fly-by's and then trying to figure out again where the chopper is, while the helo can turn around itself and keep its target locked. There are some researches about helicopters A2A capability, only defensive, but shows that it usually brings to fast movers great troubles to achieve a lockon and an engagement, not to mention kill. Being able to fly at medium heights would minimise audio signature and risk from ground based small arms fire... but then flying very high in a jet powered transport aircraft and parachuting in in a HALO mode is also quiet and does not risk a very very expensive stealth helicopter. Actually GarryB, jets have a hard time fighting against helicopters. Modern radars can see hovering helos from great distances and missiles like the R-77 can engage hovering targets within a few metres of the ground. The only safe helicopter is hovering behind something like a tree or ridge line. the reason they fly low is concealment is their best option. There are some researches about helicopters A2A capability, only defensive, but shows that it usually brings to fast movers great troubles to achieve a lockon and an engagement, not to mention kill. Helicopters have the enormous disadvantage of fighting from standing in a pit, while a fighter pilot is on the top of a parapet wall of a huge castle. A PAK FA will be able to detect low flying or landing helos from huge distances and be able to engage them with long range missiles... most helos wont even see what hits them. the helo... even if fitted with a modern AAM will be firing from low altitude and low speed which will dramatically reduce the effective range of the weapons... a fighter at medium altitude can see helos from enormous distances... hit them from long range, and are fast enough that the helo cannot escape and can fly high enough to be out of practical reach. There is a reason there are no dedicated Air to air helos. There have been war games, tests and researches about that after Iran-Iraq war, which both russian (soviet) and US sight were suprised about the events. I will provide the american source of US Army Command and General Staff College, School of Advanced Military Studies. I will just screenshot, do not have patience to write it down. It has to be noted that attack helicopters, come more often with Radar Warning Recievers than with any other sensor to warn the crew from threats, that making it more aware of possible Fighter aircrafts threats and procedure of masking themselfs among the ground clutter, which reduces their detection possibility and range very low, usually within visual range. The other fact that Attack Helicopters, specifically speaking about russian, have a standardized requirement since the incident with the german intruder in his one engines cessna landing on red square in Moscow, which steered up quite some trouble and open eyes that fighter aircrafts had problems following, identifying and pursuing such targets, therefore only helicopters could fullfil this niche. The capabilities in detection and weapons deployment of fighters have obviously increased in x-folds, but the disadvantages in detection and deployment of weapons have not changed in favor of fixed wing aircrafts. This tactic after being warned by RWR that fighters are fixing on helicopters is their only solution and the best solution to drag jets into WVR fights, which they do not dominate undisputed. The only reason there are no dedicated Air-to-air helos is that they are to slow, low range and low altitude which means they could only hunt their own kind, slow,low flying targets on operational level, which they already do. Flying laboratory testing rotors and other equipment for future high speed helicopter on base of MI-24K (we refered to it few gimes before, this is first photo ever to leak). 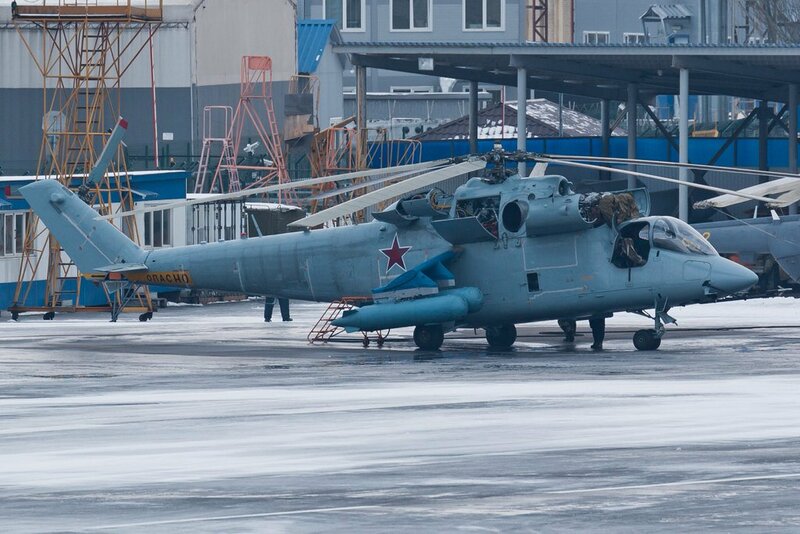 Militarov wrote: Flying laboratory testing rotors and other equipment for future high speed helicopter on base of MI-24K (we refered to it few gimes before, this is first photo ever to leak). 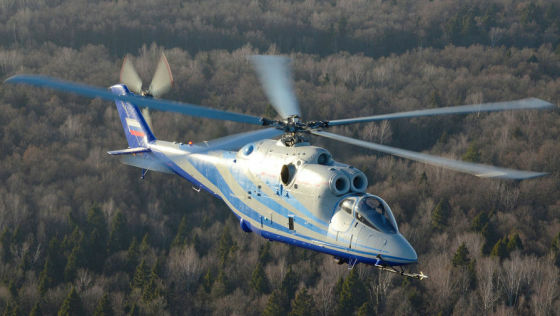 Russia’s latest combat helicopter boasting a flight speed of a whopping 450-plus kilometers per hour will be test flown in June, deputy director of the rotorcraft’s parent company Russian Helicopters told RIA Novosti. “Work on the new helicopter is proceeding at full swing. We decided to split the project in two. 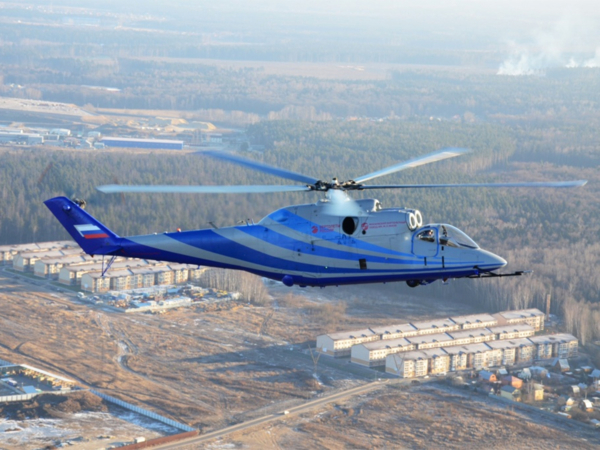 The demonstrator has already flown and will now be used to research technologies for increasing the rotorcraft’s flight speed to over 450 kmph,” Andrei Shibitov said. He added that the flight speed of the new helicopter was designed to exceed that of the existing ones by an impressive 50 percent. The maximum speed of existing helicopters does not exceed 300 kmph. The actual appearance and technical characteristics of the superfast Russian helicopter will be specified by the Defense Ministry, Andrei Shibitov said. Rival aircraft manufacturers – Eurocopter and Sikorsky – are testing prototype models, with the Sikorsky X2 having surpassed 460 kmph and Eurocopter X3 featuring slightly lower speed but superior cost-effectiveness. Im surprised that despite all the attention on Russian military development, this project did not received much attention from west. Gary you can make HALO jump but enemy airdefense radars would see you and you cannot come back and extract the clandestine team. Low RCS helo would be ideal for this job because it could not only come back and pick up the team but it can fly low and avoid the L-band radars that could detect VLO designs without problems. So the only reason there are no dedicated AA helos is because they would be crap for the job? Helicopters could be easily detected from very long range and an active radar homing missile could be fired from long range... ie +30km and the helo would not know what hit it until at about 5km range the ARH missile lit the helo up with active radar and about 5 seconds later impacted the helo blowing it to smithereens. the helo could do nothing to return fire and would have no idea what was attacking it. Such a helo could only operate in a region with no air power... like an F-117 couldn't operate with enemy air power in the same air space and is rather expensive... makes rather more sense to use a cruise missile. As shown by recent Turkish misadventure, helicopters' main threat is that they have low ceiling, are subsonic and are even more fickle machines than jets. There will never be stealth helicopters because regardless how big your helicopter is Mi-2 or Mi-26 the main rotor is the biggest RCS source due to the methods used by ground radars of calculating the relative position and the pace it takes from the first and second and all following measurements of their current position. To lower the RCS it would need to lower the RCS of the rotor blades which creates a lot of problems, those are AERODYNAMIC objects and have to follow aerodynamic laws and not RCS reducing of their shape or materials. They are the highest stressed parts on all helicopters along the gear box and turbines, so no measurements can make it such a low RCS source as you would need to operate it in the new 5th gen defined environment, to fly them high enough to gain speed but not high enough to be exposed to ground forces LOS/radar (50-150 or 400m altitude to have effective capabilities against other air targets.) The role it should have according to their requirements is to have more direct involvement versus other air targets, a much higher speed is obviously required, a reduced weight and with it armor is most probably a consequence so we will see them as a niche among attack helicopters rather then a replacement. Reduced RCS helicopters? Yes! Stealth helicopters? No! Werewolf wrote: There will never be stealth helicopters because regardless how big your helicopter is Mi-2 or Mi-26 the main rotor is the biggest RCS source due to the methods used by ground radars of calculating the relative position and the pace it takes from the first and second and all following measurements of their current position. To lower the RCS it would need to lower the RCS of the rotor blades which creates a lot of problems, those are AERODYNAMIC objects and have to follow aerodynamic laws and not RCS reducing of their shape or materials. They are the highest stressed parts on all helicopters along the gear box and turbines, so no measurements can make it such a low RCS source as you would need to operate it in the new 5th gen defined environment, to fly them high enough to gain speed but not high enough to be exposed to ground forces LOS/radar (50-150 or 400m altitude to have effective capabilities against other air targets.) The role it should have according to their requirements is to have more direct involvement versus other air targets, a much higher speed is obviously required, a reduced weight and with it armor is most probably a consequence so we will see them as a niche among attack helicopters rather then a replacement. Better train you pilots to hide between trees and mountains than spend money on a stealth helicopter. As we have seen till now, the most important threat to helicopters is manpad, not radar guided missiles. At their maximal range you can hear them so no need to reduce RCS. Biggest threat to helicopters has not changed since Cobra's Vietnam war, guns, lot of guns and not the myth of MANPADS. They are a threat but nowhere near as guns of calibres such as 12.7mm++. What do you mean that you can hear them at their maximum range? Maximum aucustic range depends on environment, temperature and environmental accustic surroundings to actually a) hear it and distinguish it between the noise of surroundings b) distinguish early on the direction it is coming from, before it spots you or even engages you and c) have means to use effective weapons against it. Maximum range of manpads or guns. Sorry, I wasn't clear. If you watch last videos put online (russians Ka-52 in Syria or Cobra shoot down) you can see that they go really close to the target, less than 1km. So if you are hidden (hidden with special forces tactics) with your manpad or guns like you said you will hear them before they see you. Environmental accustic surroundings is not a big issue if you are in mountains or in a city without activity like in Syria. The problem is if you miss to shoot it down then your dead. That's why I said helicopters don't need to be steath or have reduce RCS, they fight in front line. Russian or US radar will always be able to detect them. New active protections are more usefull. The difference is that the new requirements is that helicopters need to have offensive capabilities against air targets and not just defensive, meaning they should have more speed and more weapons integrated for such a role, that means they differ from todays helicopters. They are and will be more niche helicopters for quite some time and the current attack helicopters will stay with their intented role. The other thing is MANPADS can be reduced as a threat with TWICMS protection suites like Vitebsk and DIRCM dazzlers while bullets are still a threat since armor is not thick nor distributed over the fuselage equally or sufficient enough to protect it all the time.